The Prolight Techlace is available now from www.giro.com and authorized Giro dealers for US$400 / €399 / £349. 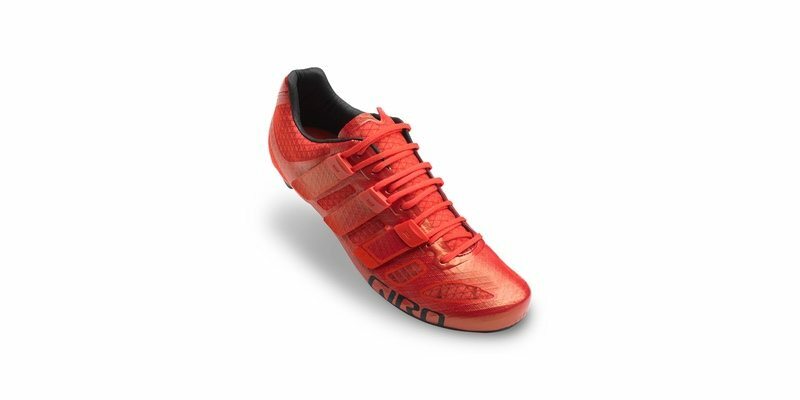 “Giro is dedicated to pushing the limits of professional-level gear,” said Simon Fisher, Giro Footwear Product Manager. “We wanted to make the absolute lightest shoe possible, but it still had to be comfortable for three weeks of 5 hour stages and, at the same time, deliver the efficient power transfer pros demand. Techlace Pro closure system: combining the custom comfort and multiple contact points of laces with the ease and on-the-fly adjustability of hook and loop straps, ‘the Techlace Pro Closure instantly won converts when it debuted on Giro’s Factor Techlace’. Technical Mesh upper: built from a custom monofilament fibre, this reinforced mesh fabric is welded to Teijin TPU film to give structure, support and durability. TeXtreme carbon fibre outsole: used by top F1 race teams, TeXtreme spread tow carbon fibre uses a unique, flat weave that requires less resin allowing Giro to reduce the weight of its outsole by 22% while maintaining stiffness. Founded in Santa Cruz, California in 1985, Giro Sport Design has developed ‘new ideas to enhance the ride’. From lightweight, high-performance helmets for cycling and snowsports, to apparel, Giro maintains a strong focus on creating products that enhance the feeling of freedom and independence that are at the core of a rider’s experience.